Meghan Markle will sit down with the royal family to watch the Queen’s speech on Christmas Day at Sandringham, but Her Majesty will not join her. 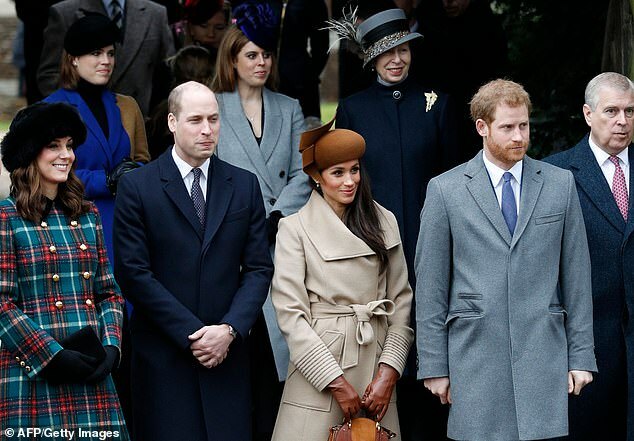 For the most senior royal never joins the family when Prince Charles, William and Harry and their families gather round a TV set to watch her Christmas address to the nation. 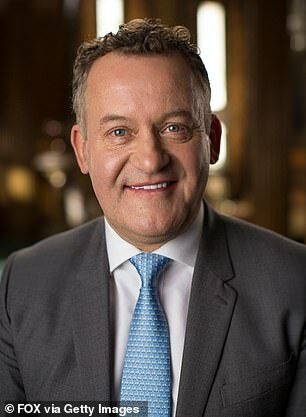 Giving a revealing insight into what goes on at the Sandringham estate during Christmas, former royal butler Paul Burrell revealed the monarch hates seeing herself on TV and makes a point of avoiding her annual festive address. ‘The Queen’s Speech will be played at 3pm, they go through the saloon drawing room and switch the TV on, people will be expected to be there, he said. ‘But the one person missing will be Her Majesty, who will slip through the north end door and go for a walk, as she doesn’t like to watch herself. Following her annual festive lunch at Buckingham Palace on Wednesday, the Queen travelled to Norfolk on Thursday to begin her Christmas break at Sandringham. 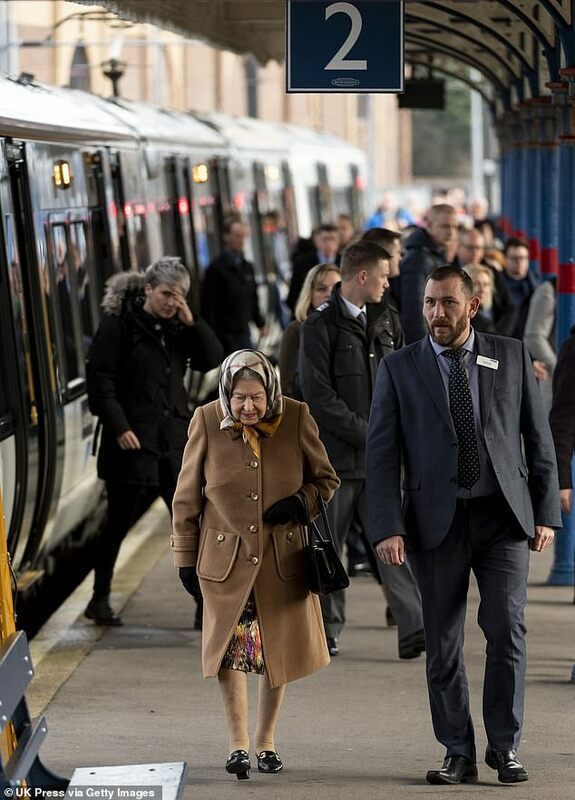 You might be preparing for a trip this weekend yourself, but there was no pushing through crowds with a suitcase full of presents to catch a train for Her Majesty! Instead she looked as perfectly put together as ever in a cosy camel coat and one of her signature printed headscarves. She's got styles by Hermès in her collection, but this one is distinctively a Burberry design. If the check print wasn't enough of a giveaway, the little detail you can just see in the middle is the British brand's logo. It's probably either vintage or made just for the Queen, so instead, click (right) to buy something similar. She's single-handedly bringing back the headscarf and why not? They're super practical, particularly when travelling. Or check out the best of the rest in our edit below. ‘Then when she’s back they will congratulate her saying: ‘Oh, you were very good this year Granny. Well done’. 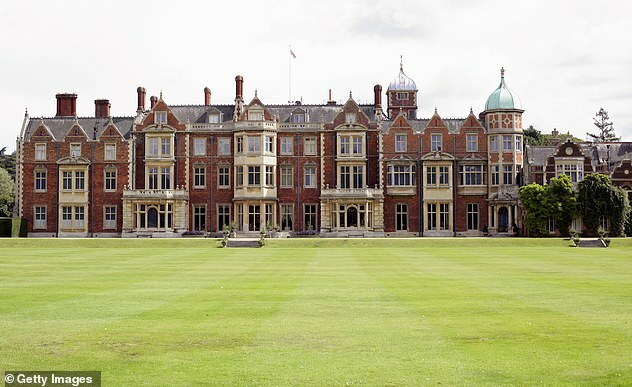 The decision by the Queen to miss her speech is just one of the quirky goings on at the Norfolk estate that newcomer the Duchess of Sussex will have to get used to. She will find her Christmas with the royal family unlike anything she has experienced, according to Princess Diana’s former butler. From the moment she wakes up the entire day will run like clockwork with lunch, drinks and even party games timed to perfection. 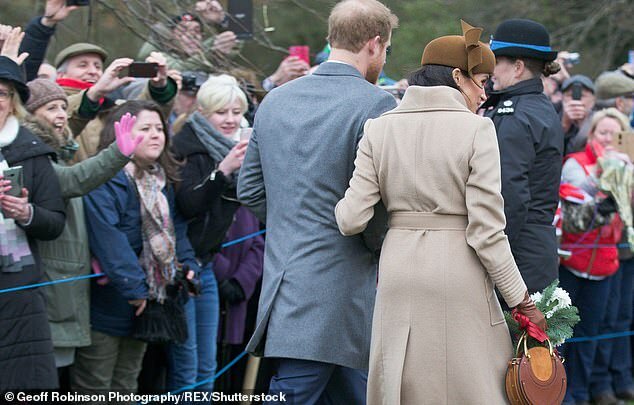 And while Meghan is likely to find the occasion overwhelming Princess Diana’s ‘rock’ said she could do no worse than join in the fun at the Sandringham estate – but risk missing the Queen’s televised speech at her peril. While there are said to be tension between Meghan and the Duchess of Cambridge they are unlikely to surface as they sit round the table for Christmas lunch. Family attendance the event is mandatory with Burrell saying all family members are expected to attend. ‘The Queen uses a three-line whip. You’re invited, you don’t refuse, you don’t ever turn the Queen down, said Burrell. The seating plan for the lunch will have been carefully though out and any ill feeling among family members will be expected to be put aside and engage in polite small talk. ‘Even on Christmas Day, it’s all timed. You can’t say you ‘feel woozy, let’s have dinner later’, he said. ‘You have to sit next to someone you’ve not sat next to before, making polite conversation. There’s no opting out. ‘I’ve never seen any member of the Royal Family totally drunk and being helped to bed, but certainly I’ve seen them merry – and Christmas is that time. Unlike most families who have eaten too much and settle down in front of the TV, the Queen and her family will be making their own entertainment. As a Hollywood actress Meghan would be expected to excel if a game of charades is on the Christmas Day agenda. She will have been advised by Harry about how the day unfolds and also what present she could buy for the Queen. Recalling his visits to Sandringham he said: ‘A book is a good present (for the Queen), she loves Jeffrey Archer novels and crime fiction. Or anything with horses or sport, but she loves a thriller. 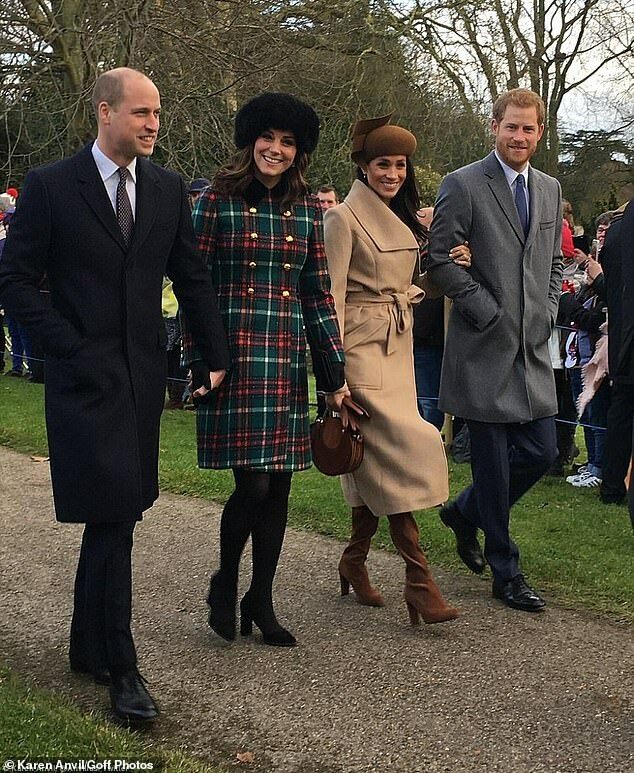 He advises Meghan that ‘practicality is the word’ on buying a Christmas present for the Queen, someone ‘who has everything’, saying: ‘Get something for the picnic, a tartan rug, Tupperware containers, something for the barbecue as Prince Philip likes tongs or the latest pepper mill. Or dog leads, as The Queen is always losing them. ‘One year all the household staff had a collection and bought the Queen and the Duke of Edinburgh an ice bucket with all our names inscribed into it. Burrell, who served as a footman to the Queen before becoming Diana’s butler until her death in 1997, had told Daily MailTV that ‘Sandringham is Downton Abbey on speed’ and that it would be a Christmas ‘full of egos’, where she should stay close to Harry and the Queen – because other royals will be out to get her, setting ‘traps’. He says that Meghan’s own family troubles – with her father Thomas Sr taking part in staged paparazzi photos and with her half-sister Samantha’s publicity-hungry outbursts – could be nothing compared to what will hit her when she travels up to the family’s country estate in Norfolk for four days from Christmas Eve.